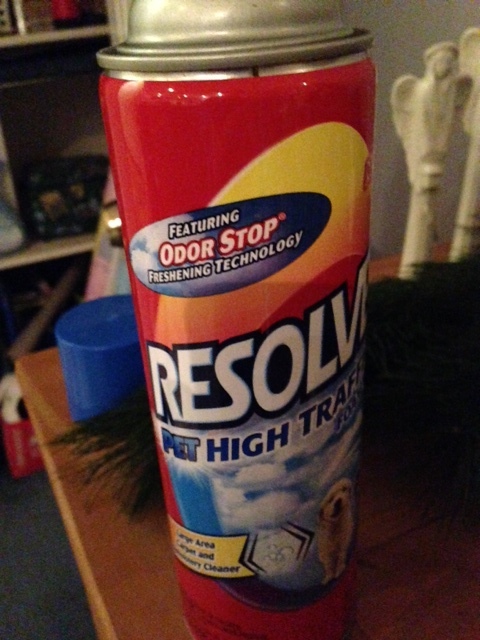 What a great name for a product, Resolve. It’s what I use on my carpets when my dog makes a mess. We have it in wide spray for “high traffic areas” and point and shoot for those smaller spots. Unfortunately, today there was much need for resolve and there wasn’t enough left in the can. I’d like to say that this morning when I discovered the multitude of the project before me, I held my nose happily and, servant that I am, gamely took to the clean up. But no. I plopped down on the floor, rag in hand, and lamented, “there goes my devotional time.” Because that’s what this morning quiet time is reserved for. Sitting happily before my little lit Advent candle, saying prayers, reading inspirational writing and Scripture. But this morning as I scrubbed, that became devotional time. Always with thanksgiving. Prayer never-ceasing, right? Oh, how God must feel when again and again we call on Him in the midst of our messes, piles that must be cleaned up so we can move on. With that thought, all of a sudden, my sullen demeanor turns a bit more to care and tending. This an old, old dog. Addled and wandering. He’s lost most of his senses and much of what he used to control. The process has been gradual. It wasn’t taken from him all at once. In my care of him I have a glimpse of what befalls us all if we last. It’s really quite gracious of God to give me fair warning. 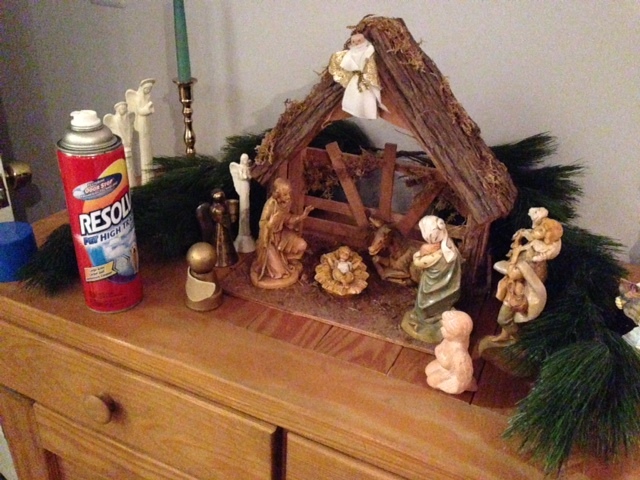 I set the empty can of Resolve on the counter, in the only space available, right next to the creche. Nestled between the angels proclaiming the good news to a small family in a sodden stable. Thus chastened, I returned to my scrubbing and, wouldn’t you know that the Resolve spray “for large traffic areas” settles invisibly on your carpet, until your add a bit of water on a rag. Then you can see it has expanded to service a broader area. Ah, my little version of a loaves and fishes moment. Imagine, if I had thought to bless before spraying! So, there you have it: today’s devotion in the do-do. Literally. Posted on December 16, 2013, in Body, In Action and tagged devotion, dogs, enunciation, housework, Jesus, Mary, messes, resolve. Bookmark the permalink. Leave a comment.